Omran is alive. His older brother, 10-year-old Ali, is dead. We in the international community (Canada, US, UK, and others) failed the many Alis, Omrans, and Syrians in this war. They died and suffered under our watch. We, the member states of United Nations, love to *talk* Responsibility to Protect (RTP) doctrine but usually end with massive “Failure to Protect” unless our national interests (oil, other resources, our own securities) are at stake. Have we not learned enough from the tragedies in Rwanda and the Balkans in the 1990s? I hope/wish and agree that “Omran’s picture must be a turning point in Syria’s war“. And I will add my voice to urge our Canadian Prime Minister Justin Trudeau and Minister of Defence Harjit Sajjan to try to do what is right, on our behalf. At the end of the day, there is no escape that Ali and many other Syrians had died in this war, and Omrans and many other Syrians suffered under our watch and we failed them. Whether we keep on failing our Syrian brothers and sisters, letting them die, allowing the refugee crisis to get even worse, or we say enough is enough and actually commit to stop this massive human atrocity, it is up to us “word citizens” to tell our governments what need to be done. “A week later another colleague from M10 hospital rang me and told me he had treated Omran, the young boy whose picture had gone viral on social media. To be honest, I had not seen the picture. He simply wanted to tell me that the boy had survived and he had treated his deep scalp wound and he was going to be discharged home. Shall Copyright Law trump Freedom of Press? NASCAR and Encana seem to think so. For the case of NASCAR, see reports in Washington Post and Paid Content. For the case of Encana, see my summary reporter in examiner.com. Claimed “copyrighted” audio clip in the Encana case. To me, the two original songs are much more interesting than this Rewind remix. What do you think? In fact, some of the more interesting remixes of the two songs are likely more fun/entertaining to watch than Rewind. My personal favorite remixes include Gangnam for Freedom – Anish Kapoor and Friends (252K+ views) which was a direct result of Ai Weiwei’s 草泥马 Gangnam Style (994K+ views). And the Call Me Maybe – 2012 USA Olympic Swimming Team (10+ million views) remix. note: This article is cross-posted by me to examiner. I’m amazed by the perfect social media storm created by #KONY2012 designed to spotlight Joseph Kony and the tragedy of child soldiers. I will use 28 screen-captured pix from #KONY2012 that I found illustrative to highlight the documentary’s strength, weakness, and intended / unintended consequences. 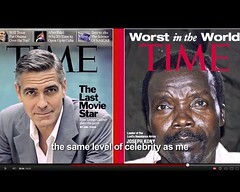 It is indisputable that Joseph Kony is now a famous/infamous man known to the world especially the youth that supported #KONY2012. 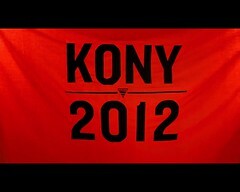 Does it make it easier to capture Kony? 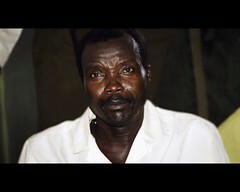 Or will this fame actually make Kony harder to be found? I don’t know. Extending a blunt observation made by Malcolm Gladwell in his 2011 speech, even with all the military resources and technologies of the United States, it still took the CIA over 10 years to find Osama bin Laden. Of course, putting a bright spotlight on Kony has the benefit of bringing awareness to the tragedy of child soldiers up front which is important and I will address next. To me, one of the most important achievement of #KONY2012 is to bring the tragic problem of child soldiers up front to people’s and politicians’ minds. At the same time, the oversimplifications also fail in important ways which I will talk about later. I first learned about child soldiers in 2008 from Romeo Dallaire (his actions saved the lives of ~32,000 people in the 1994 Rwandan Genocide where an estimated 800,000 people were murdered) at Engineers Without Border in Calgary – Are all humans – Humans? Here is a video clip of Dallaire talking about his battle to end child soldiers in Nov 2010. Note: Dallaire is the founder of the Child Soldiers Initiative, a project aimed at eradicating the use of child soldiers (see the team bios), and author of “They Fight Like Soldiers, They Die Like Children: The Global Quest to Eradicate the Use of Child Soldiers“. 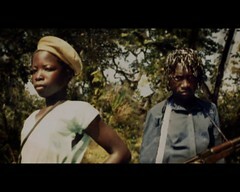 Another clips of talking about Child Soldiers, the special tragedy of girl child soldiers, Responsibility to Protect doctrine. You are currently browsing the archives for the Viral Video category.